My Sweet Haven: Hubby's first DIY TV repair. I was surprised to discover that this is rather a common issue with this particular Sony TV model. Hence, you can easily find a few sites that tell you what the problem is and how to possibly fix it. 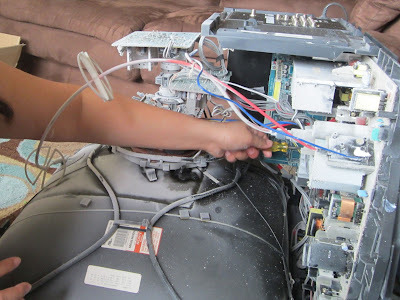 I actually found one that does not only simply talk about how to fix a sony wega with a 6 or 7 blink code, but offers very clear picture information about the whole process. I showed it to Jeff and he thought it will be a great DIY project. He didn't have any electronic technical experience or whatsoever, so this project is more like another fun thing for us to spend our time on together. If it won’t work, then we’ll definitely get us a new TV but if it does, then we’ll get a few more years out of this unit and most importantly, I’ll be so damn proud of my husband, lol!!! We spent around $60 dollars for the IC chips, sockets and new soldering tools. Not bad at all! We could have spent a few hundred dollars more if we took it to a professional repairman. I’d say the most painful part of the whole process is removing the ‘D’ board where the ICs are located. We have to unscrew and unplug some of the wiring connections. The cables and wires inside the TV look all too convoluted to me, so I left most of the work to Jeff, lol! Hey, I did help him with removing the screws. I held up a tiny flashlight for him and of course, I put the baby down for a nap, lol! Oh, and I should mention I took pictures, lol! At least, I tried to be helpful. Anyway, Jeff’s first attempt to repair a TV was a SUCCESS. We both felt so happy about it. It’s like we have a new TV, lol! I am really so proud of him! This is me...removing the screws! Hubby soldering the new ICs!